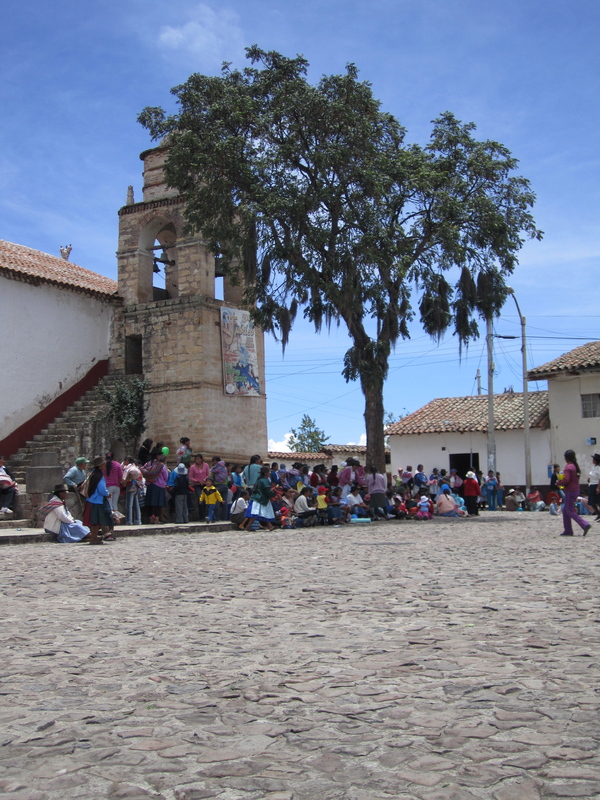 ← Huaraz – The city hand santizer was invented for. Way back in the beginning of this trip, we met a fellow traveler in Medellin, Colombia, who was also traveling through South America. Conveniently for us, he had visited most of the countries that we were planning to see and he was quite happy to dole out some must-see places along the way. 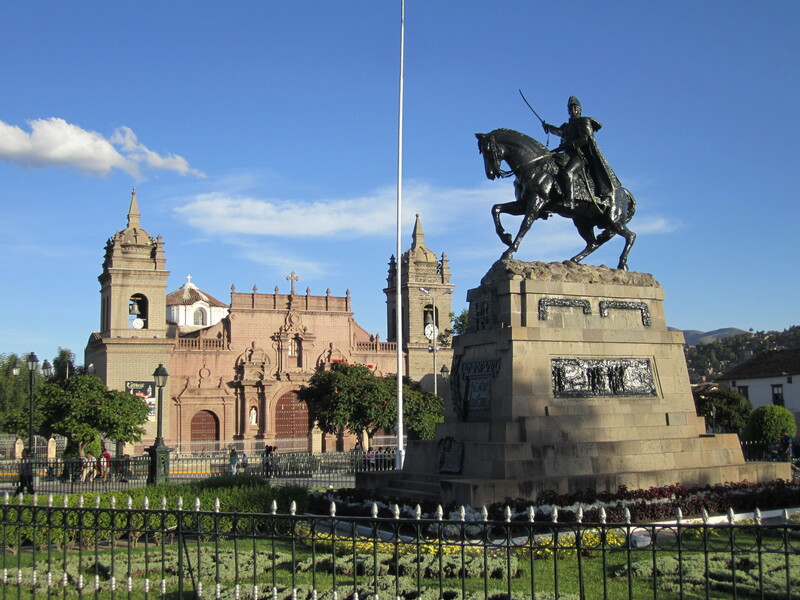 He mentioned that we need to make the effort to get to Ayacucho because it was one of his favorite places in Peru. 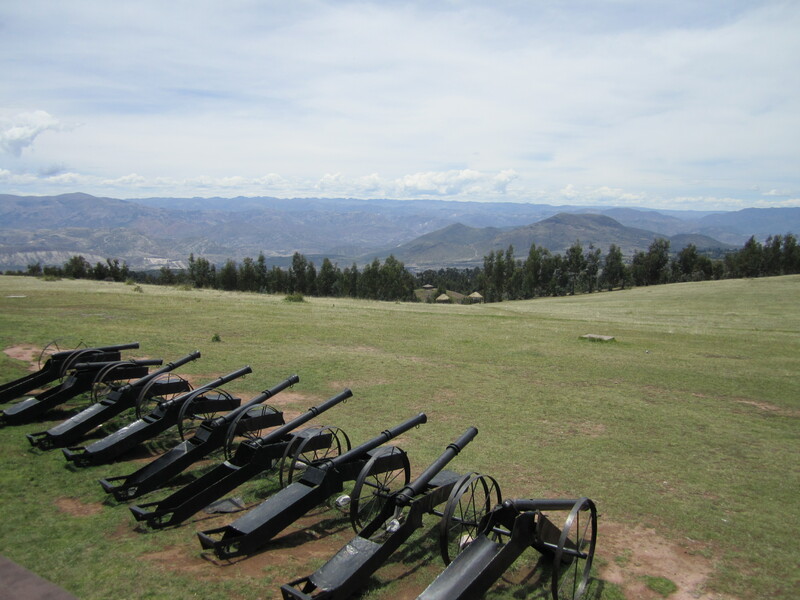 Luckily we wrote his recommendations down and our next destination became Ayacucho. 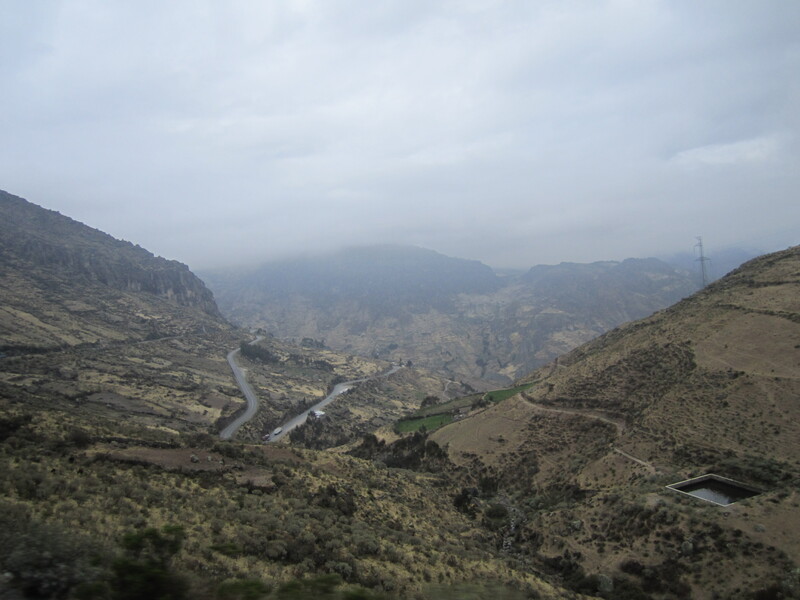 Unfortunately getting from the mountains in one part of Peru, to mountains in another part is not very quick or easy. First, we had to take an 8 hour bus to Lima. Although we chose a cheaper bus for this one, the views out of the window were priceless. In the first half, it felt like we did another hairpin turn every few minutes or so. We were relieved to see the coastline again because that meant we were out of the mountains and on the smooth and “wide” Pan-American Highway. 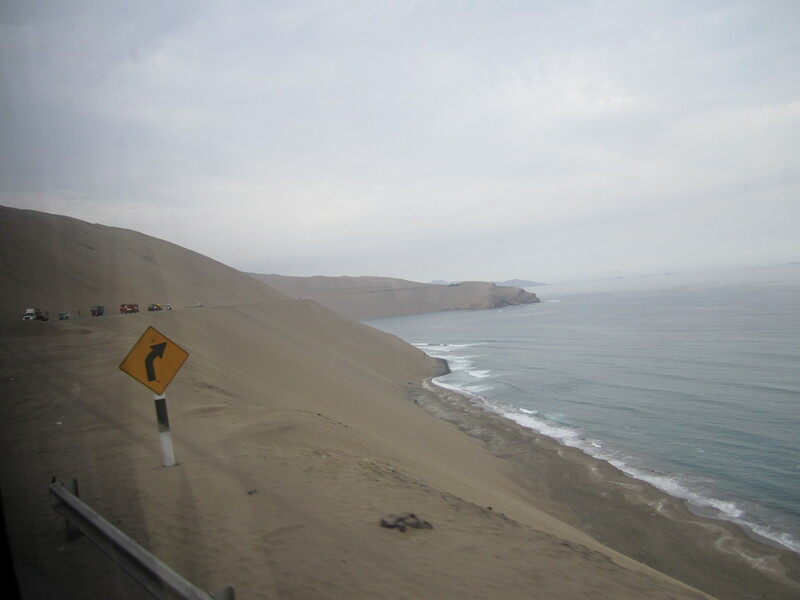 As we got closer to Lima, we rode along the coastline. It looked like the road ran through the middle of a sand dune, with a sheer drop off on one side. It was a bit unnerving, but we arrived safely in Lima without sliding down the hill. Not quite sure how this road hasn´t slid in to the sea yet. Once in Lima, we transported from one bus station to another (the lack of central bus stations in Peru can be a bit frustrating). Our second bus station had a nice VIP lounge that was playing futbol games and had free internet. Both of which helped us to while away the five hours between buses. We splurged (of course) on another luxury bus and once again got a pretty decent night’s sleep. The road was twisty and there were a few times that we took a turn so tightly that I felt like I might fall out of my chair! Thank goodness for the functional seatbelts. Instantly, we fell in love with this town’s charms. It was surrounded by mountains and had a huge beautiful square and two pedestrian walkways lined with shops and restaurants. 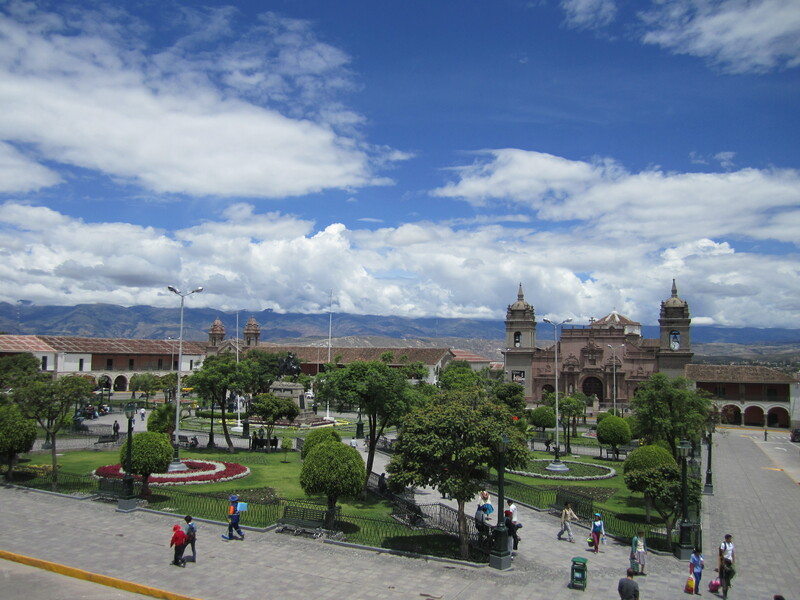 Ayacucho´s main square... so clean! Most importantly, this place was so clean! I almost felt like licking the ground, just because I could have and probably not contracted a fatal disease. 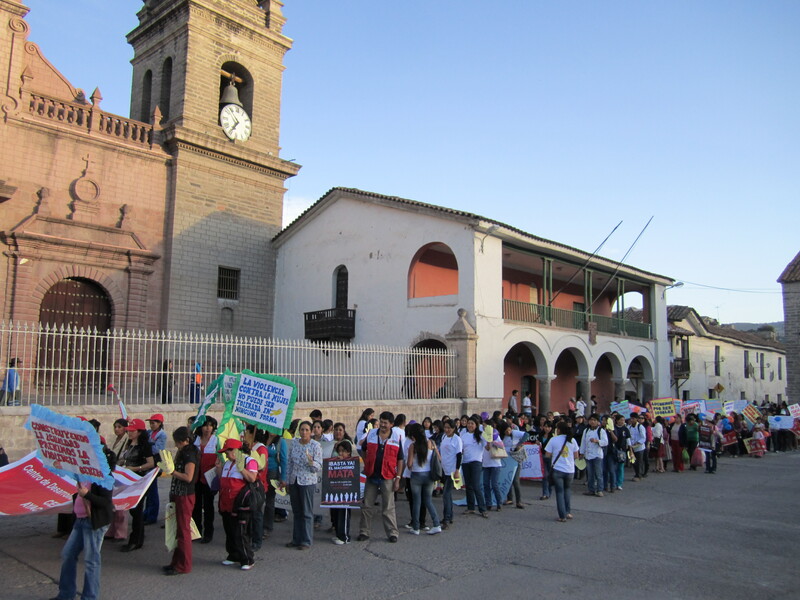 Seeing as in Huaraz, I was hesitant to even walk the streets, this was welcome change. 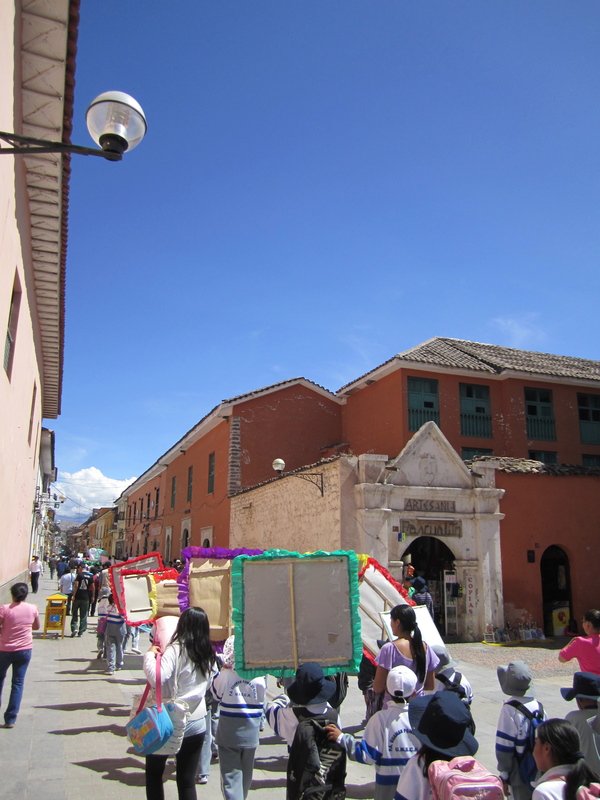 There wasn’t too much to actually “do” in Ayacucho, which is probably why when we mention going there, Peruvians always ask us, “Why Ayacucho?”. We enjoyed our time there and filled our days with relaxing, eating, trying to find a hotel with hot water and functioning wifi (a seemingly impossible combination), and just checking out the local vibe. We enjoyed being surrounded by local culture especially because we felt like the only gringos in the area. There also did seem to be a daily parade of some sort. Parading seems to be a national pastime here, even schoolchildren were seen carrying signs with various slogans. 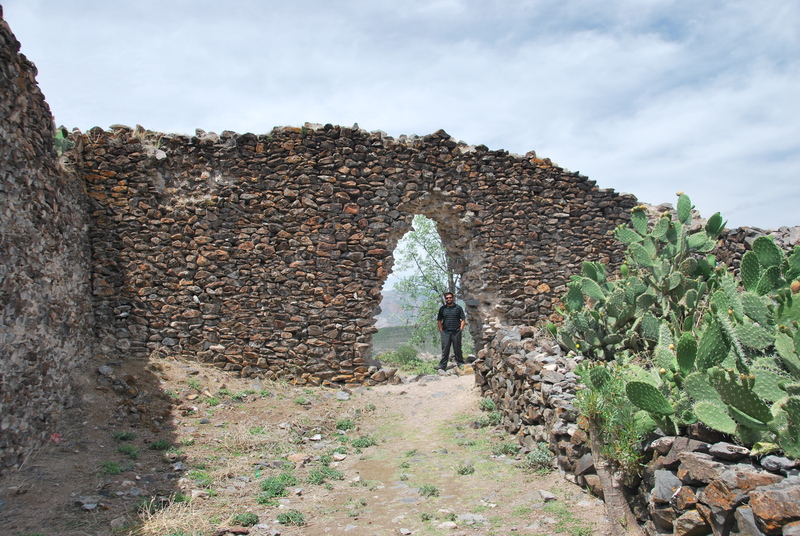 For a day trip, we caught a small bus to the Wari ruins. We had no idea what to expect, but for 3 Soles (about a dollar) we can be easily impressed. 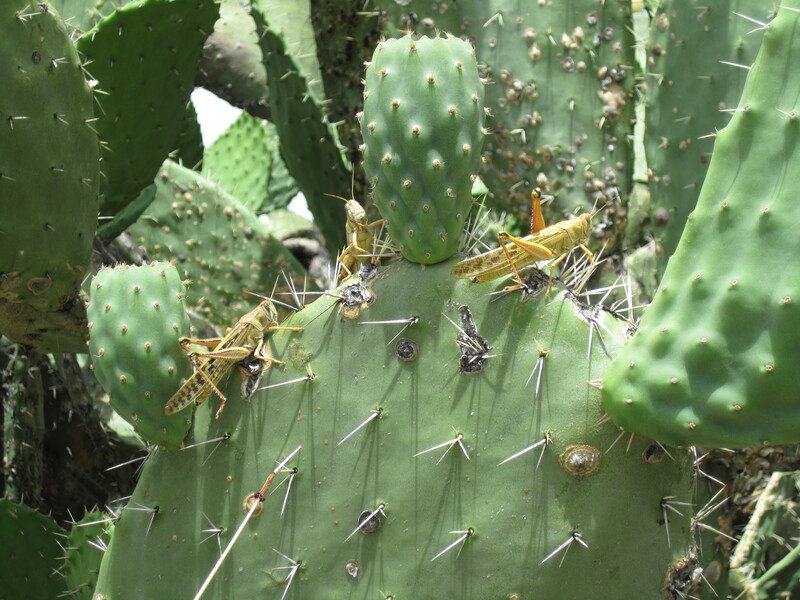 Initially we spent time chasing down the seemingly thousands of huge grasshoppers jumping around. Who knew that huge grasshoppers could be so entertaining? 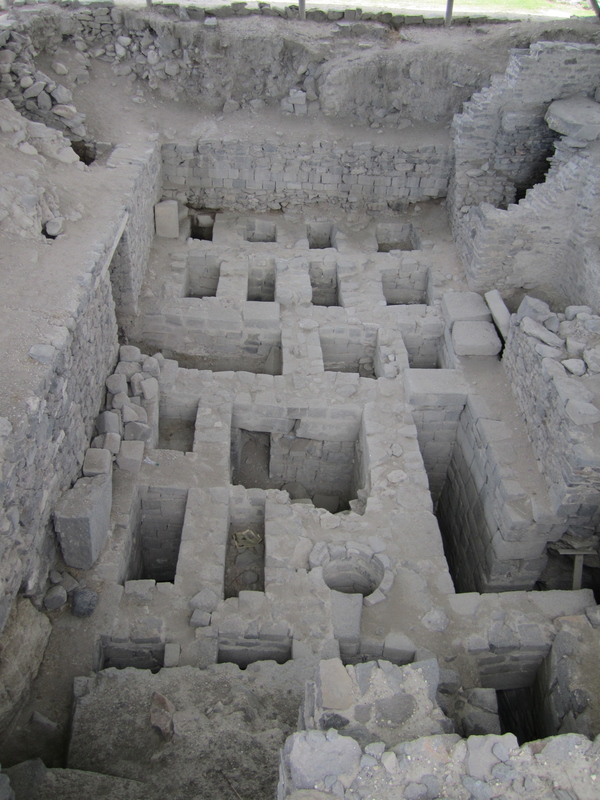 As we explored the stone ruins (again still in place after over 1,500 years without the use of mortar), we grew more interested. I guess if it's been standing for over a thousand years, we don´t have to worry about it falling down on him. Unfortunately, there weren’t any signs, guides, or real information in the guidebook, so we weren’t too sure what we were seeing at the time. Luckily, a little searching on the internet helped to fill in a few of the missing pieces, but even still, the details seem a bit lacking. 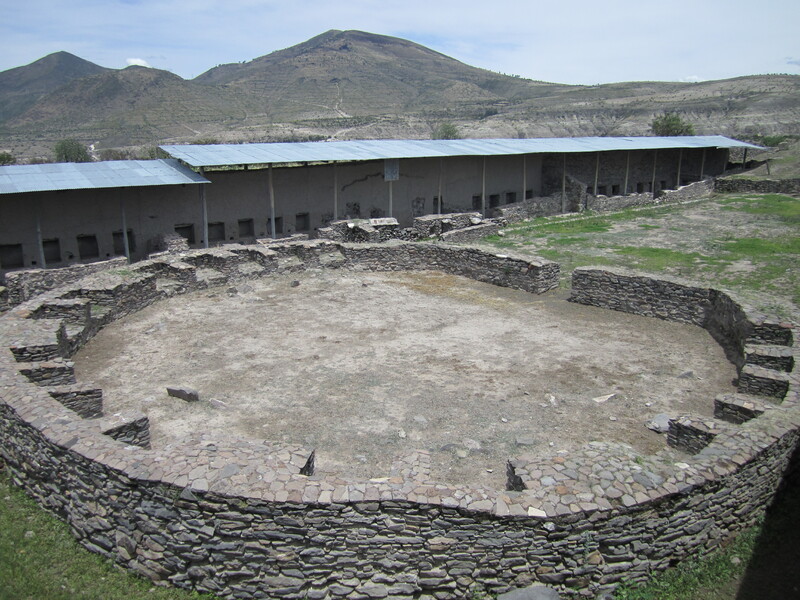 The buildings do seem to indicate that this was a capital city of some sort with housing, administrative, and religious buildings. Archeologists were actually working on the site while we were there, so maybe they will learn more about this site as they go. 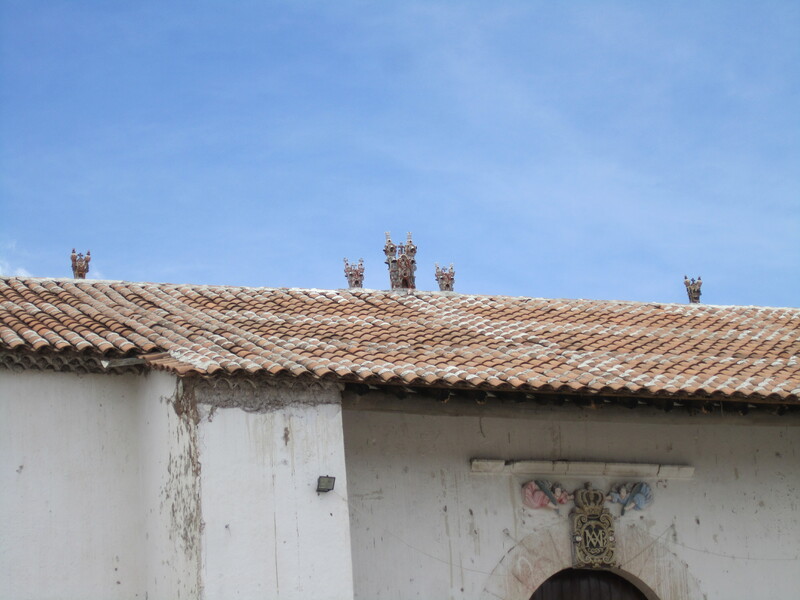 Any guesses for this building´s usage? Maybe a big game of duck, duck, goose? Crazy labyrinth of underground tunnels. These look like they were a lot of work to dig. 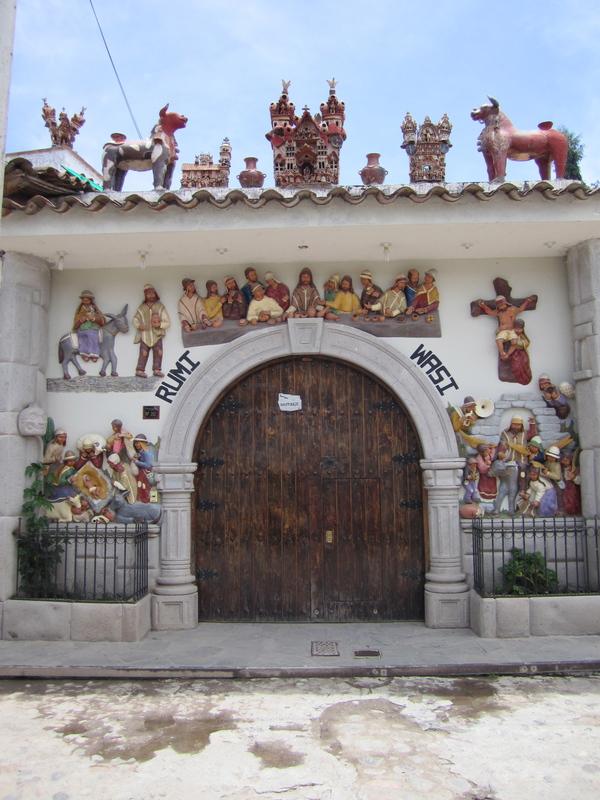 After Wari, we continued down the road to Quinua, a really small town where lots of handicrafts are made (and then shipped all over Peru to be sold). 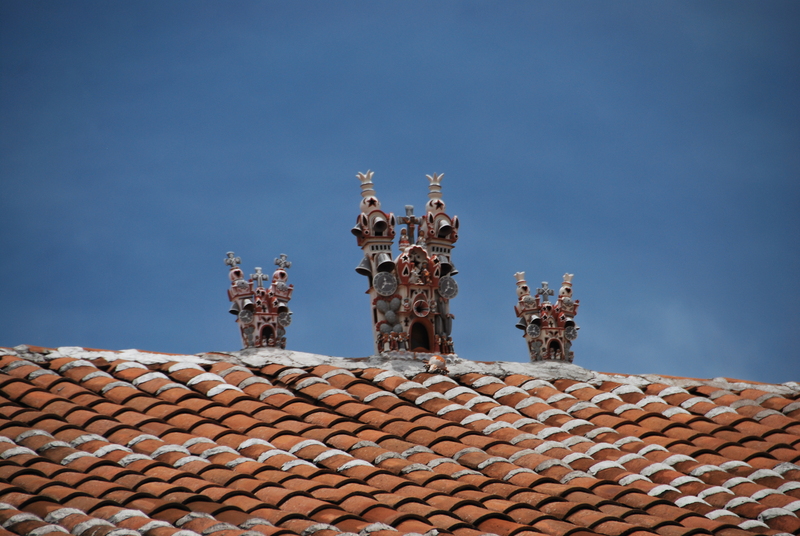 Most roofs in this town were decorated with small ceramic buildings. Oh yes, these are sold all over town. It took all I had to resist buying one. This guy might have gone a bit overboard. We happened to stumble on a gathering of women and children in the main square. Most of the women were traditionally dressed, and combined with the old world looking church and square, we felt as if we had stepped back in time. After spending some time in the square taking it all in, we hiked up to the large white obelisk commemorating a military battle. 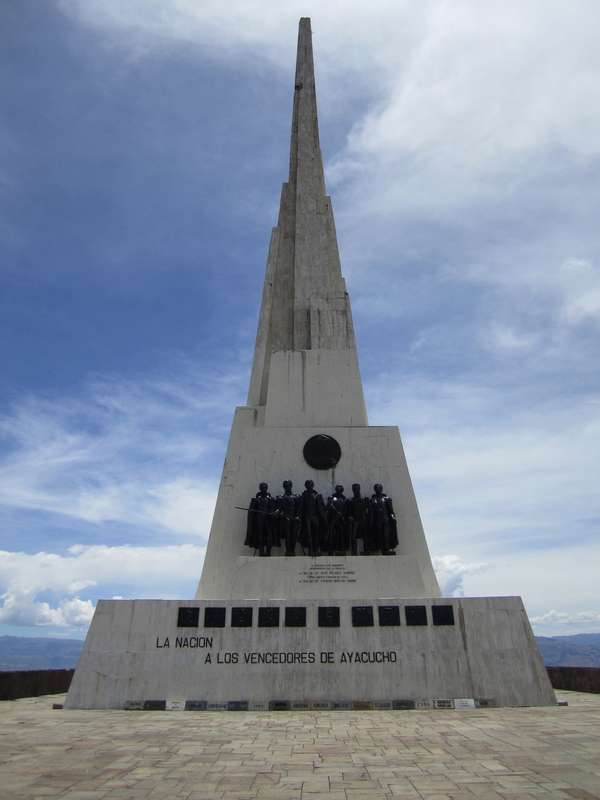 The obelisk is 40 meters high and can be seen from across the valley. The obelisk that can be seen from quite a distance. We were hoping to be able to climb up it, but it was inexplicably closed, so we just sat and soaked up the surrounding mountain views. 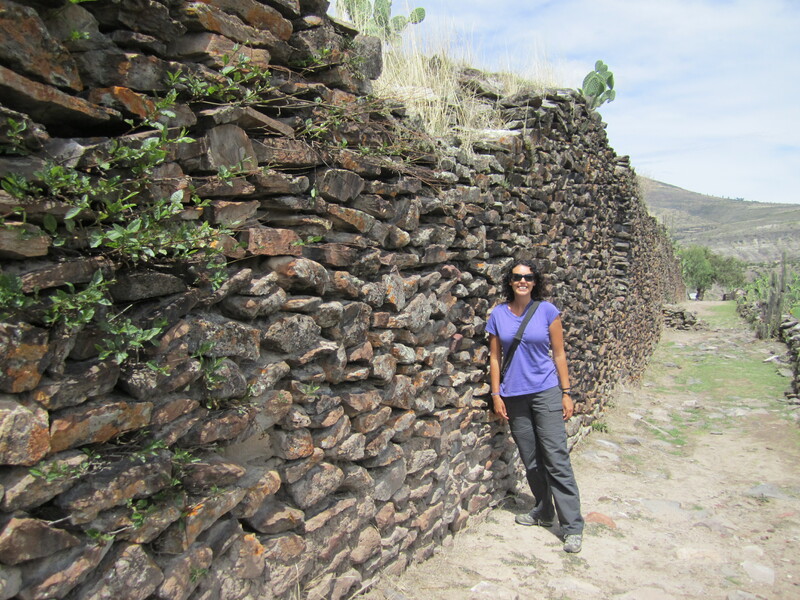 In the end, we both really enjoyed Ayacucho and would highly recommend it to other travelers. Especially now that we are in Cusco, we keep commenting that both towns have a similar look, but the towns feel vastly different due to the difference in the number of tourists running around. We miss the days of being the only two gringos wandering around. Off to Huancayo with the hope of catching the rarely running 12 hour train to Lima. Taking off for a year to see what the world has to offer.